In the sport of triathlon the Transition Area is like the hub in the center of a wheel with the swim, bike, and run like wheel spokes. The athlete passes through the Transition Area twice in the event. In the Transition Area the athlete moves from swimming to biking and then from biking to running. Every athlete has a spot in the Transition Area where his/her bike, helmet, shoes/socks, shirt, shorts, towel and other needed stuff is located. The triathlon begins at the pool. Following the swim the athlete moves to the Transition Area where he/she removes any swim equipment such as goggles, quickly dries off, puts on what is needed for the bike ride, takes his/her bike and (walking the bike) exits the Transition Area following the sign that says Bike Out. Bathing suit removal is not permitted. Athletes put on shorts and a shirt over their bathing suit with their race number pinned on in advance. Some athletes just put on a shirt (with number) and ride with bathing suits instead of shorts-over-suits. After the ride, the athlete returns to the Transition Area and (walking the bike) goes back to where his/her equipment is located. The bike is placed in the rack, helmet and other riding equipment is removed, and the athlete prepares for the run. Runners may jog to the Run Out sign in the Transition Area, watching for bikes and other runners. 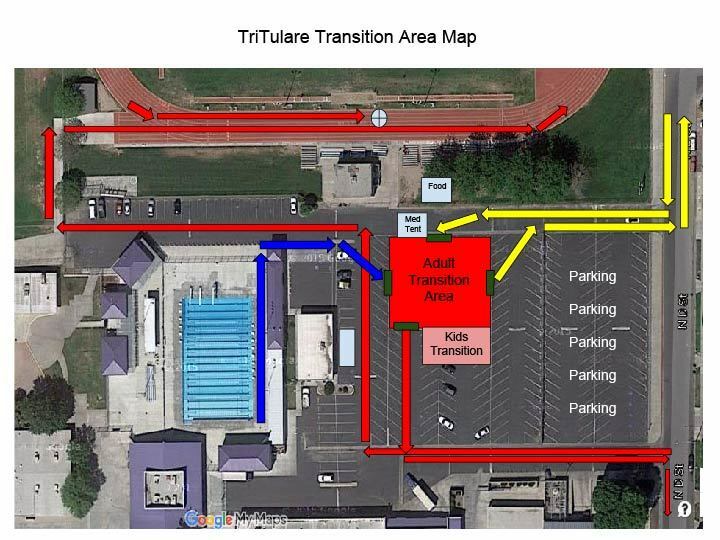 Get to the race so that you can set up your Transition Area location. Locations are not reserved but there will be enough for all athletes. After setup, please leave the Area quickly. Only the athlete will be permitted in the Area during the race. Some athletes choose to bring two towels. One is placed on the ground beside the bike at your location with your race stuff on it. The other towel is for drying after the swim. It is recommended that you have a full water bottle there so you can grab a quick drink before exiting the Transition Area. We will have water stops on the run course. The time spent in the Transition Area counts on the overall time so it should be as fast as is reasonable but not so fast that you forget to put on the helmet, shoes, or race number.